The Allen County-Scottsville Lady Patriot volleyball team capped a perfect 4-0 week Tuesday night in a straight set win over Glasgow (25-78 25-20). Monday night, the Lady Patriots downed etcalfe County (25-21, 25-21). The wins followed last week’s District 15 wins over Monroe County (25-15, 25-9) and Barren County (25-9, 25-12). 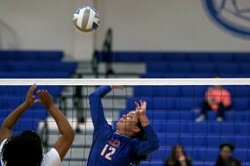 AC-S had little trouble last week in getting past the Lady Falcons and Trojanettes. Monday, the story was much the same as AC-S used a strong offensive attack and solid defense to down the Lady Hornets. Metcalfe County (3-7) was able to mount a solid challenge for most of the first set. After kills from Kalee Baldwin and Chloe Cook enabled the Lady Patriots to open a 9-3 lead, the Lady Hornets countered with an 8-3 run to edge to within a point. A smack down by Baldwin and solid net play by Cook and Macy Ward lifted AC-S to a 17-13 lead. Metcalfe County pulled to within two, 17-15, before the hosts pulled away. A Cook kill, a winner by Meg Foster, and a service ace by Baldwin capped the Lady Patriots’ 5-0 run. AC-S took the first set 25-21. The second set was all AC-S. Behind the strong serving of Olivia Brown, the Lady Patriots raced to an 11-0 lead. Metcalfe County managed to break into the scoring column only to see strong sets from Foster and kills by Baldwin help the Lady Patriots build a 17-2 lead. The teams exchanged points the rest of the way as AC-S won the set 25-7. AC-S (8-5) will travel to Westmoreland on Tursday to play Red Boiling Springs. Next Tuesday, the Lady Patriots host Franklin-Simpson (5-7).